Belmont’s School of Physical Therapy has worked in conjunction with Vanderbilt University Medical Center to launch specialized Physical Therapy (PT) residency programs in Orthopaedics (Sports) and Pediatrics, in addition to an existing Neurological program. One resident is selected for each of the three specialties, which begin in August. The sports residency lasts 18 months, while the neurological and pediatrics residencies are 12-month positions, designed to prepare the resident to sit for board certification in their specialty from the American Board of Physical Therapy Specialties. Residents get one-on-one attention from specialists in different subspecialties, and begin to manage their own caseload of patients after about two months, said Andrea Donald, director of Vanderbilt’s neurological PT residency program. 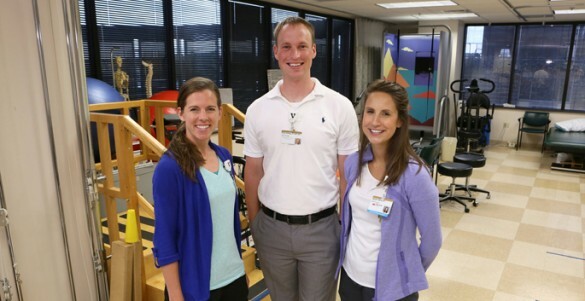 In the Neurological residency program, the resident is mentored by eight physical therapists in the Pi Beta Phi Rehabilitation Institute, which offers comprehensive neurorehabilitation services under the umbrella of the Vanderbilt Bill Wilkerson Center. The program’s mission is “to train expert clinicians in their area of focus or interest, to encourage advocacy of the profession and advocacy for our patient populations and to encourage clinical research,” Donald said. The pediatric residency program gives a wide range of experience, from acute care to outpatient, including a rotation through the Susan Gray School at Vanderbilt, a preschool for special-needs and typically developing children, said Laura Flynn, director of the pediatric residency program. Ten therapists serve as mentors as the resident participates in 28 hours of direct clinical care per week. The sports residency program, though longer in length, “allows the resident to experience working in the Vanderbilt Orthopaedic Institute outpatient rehabilitation clinic 30 hours per week as well as the Vanderbilt University athletic training room to gain on-the-field experience,” said Brian Richardson, clinical director of the sports residency program.